Legal Person plugin for GoMage LightCheckout extension allows your customers to specify whether they are making an order as a Natural or a Legal Person and fill in the additional fields with their personal legal data. This information is saved in the database and is visible under Billing and Shipping Address blocks on the Order Information page in Magento ® admin panel, as well as in customer’s account, and can be modified by a customer and by a store administrator. All the legal information provided by a customer is available in the Order Invoice, too, and can be used for official confirmation of a purchase. 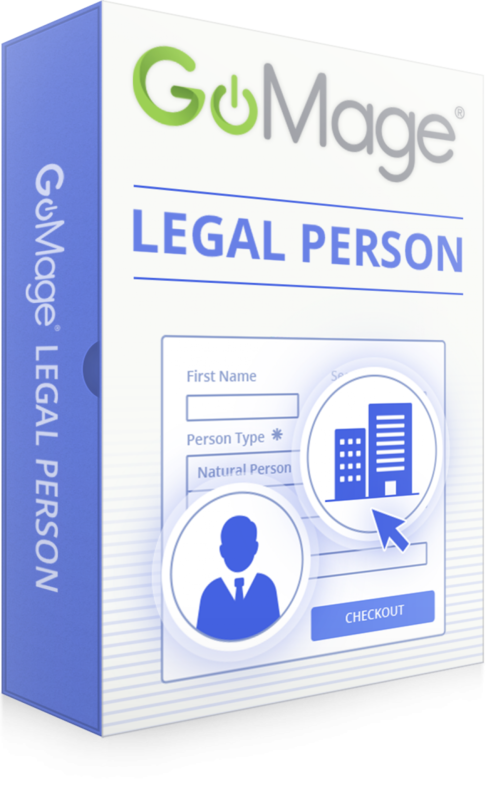 GoMage Legal Person plugin is integrated with GoMage LightCheckout extension but it is a separate product which requires a separate activation key. 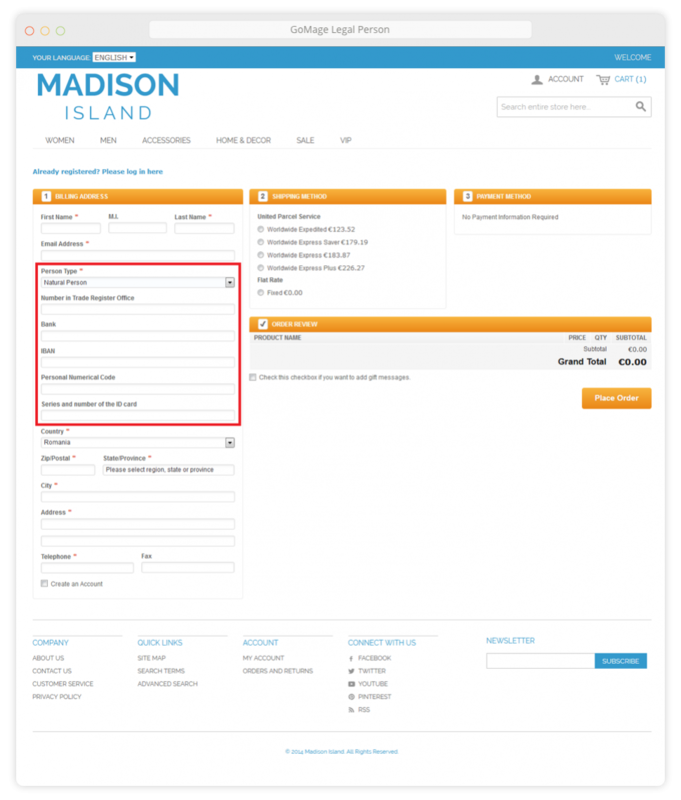 Use this plugin to distinguish your Legal Person customers from Natural Person ones, and have them enter their legal information before making an order. Choose Default Person Type that will be selected on checkout page by default. 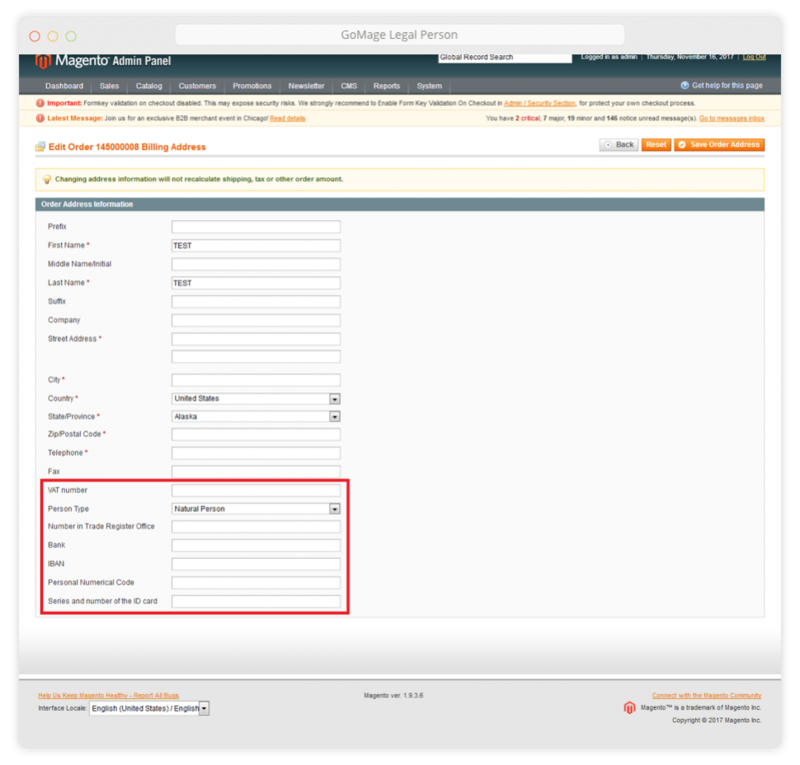 The plugin settings in Magento ® admin panel allow you choose countries for which the Legal Information fields will be available. The following fields are available in the Legal Person plugin: Number in Trade Register Office, Bank, IBAN, Personal Numerical Code, Series and number of the ID card, Company, VAT number. 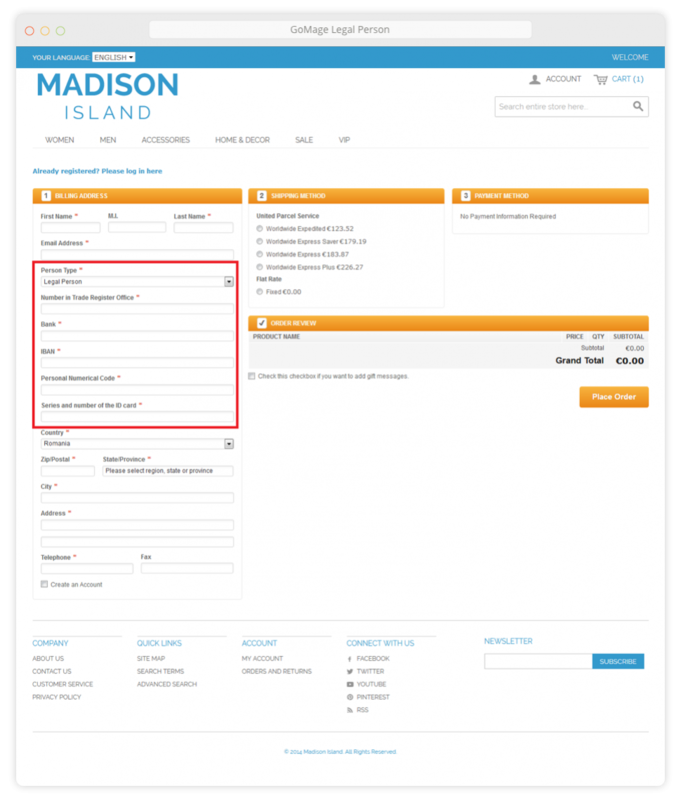 Each of these fields can be set as required or optional depending on the Person Type selected by a customer. Unnecessary fields can be disabled. All information for Legal Person is saved as part of customer’s Billing Address. 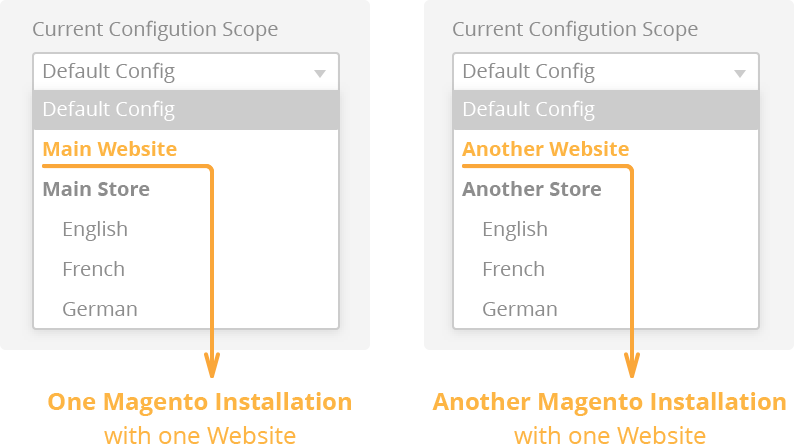 You can edit this data in Magento ® admin panel, if necessary, and customers can edit this data in their personal accounts just like any other account information. GoMage Legal Person plugin ONLY works with GoMage LightCheckout extension. Legal Person plugin must be ordered as a separate product and then installed on the site. During installation, the plugin is automatically integrated with LightCheckout extension, and its configuration tabs are added to the LightCheckout settings block. Legal Person plugin requires activation process just like any other GoMage extension and it must be assigned to the same website URL that is used for the LightCheckout license. 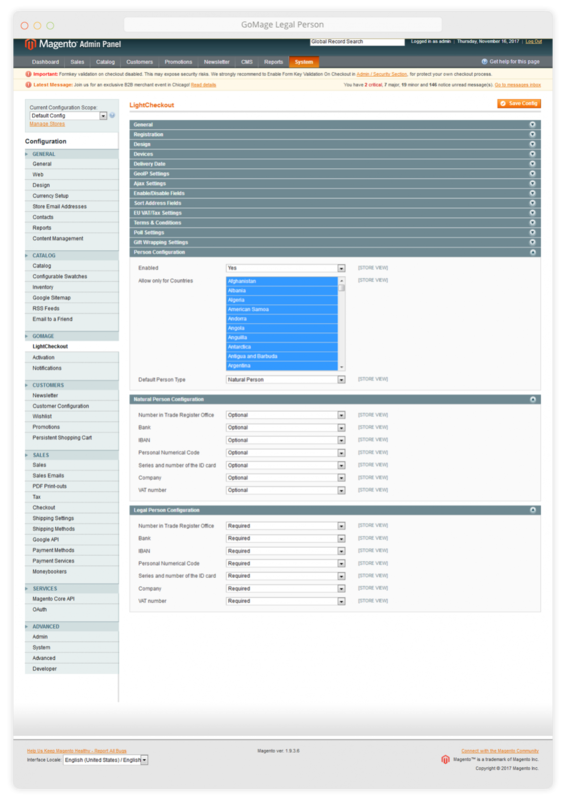 The plugin settings in Magento admin panel allow you choose countries for which the Legal Information fields will be available. All information for Legal Person is saved as part of customer’s Billing Address. 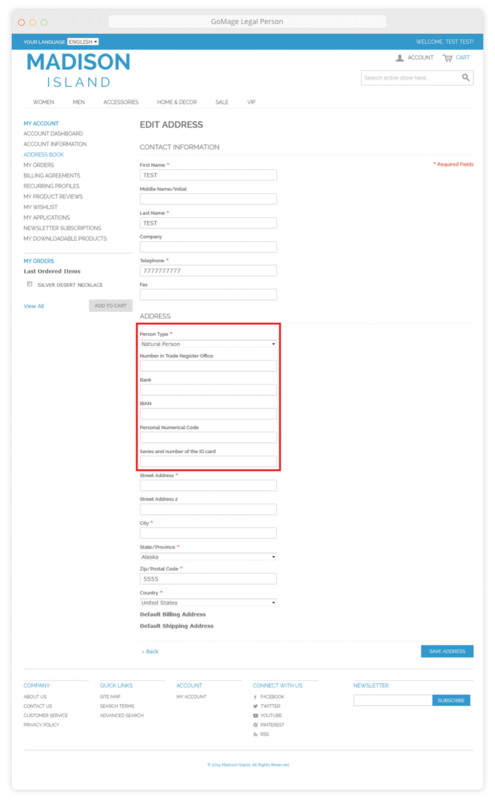 You can edit this data in Magento admin panel, if necessary, and customers can edit this data in their personal accounts just like any other account information.